The holiday house Lekic is placed directly on the beach on the Island of Zizanj, very close to the island of Pasman. 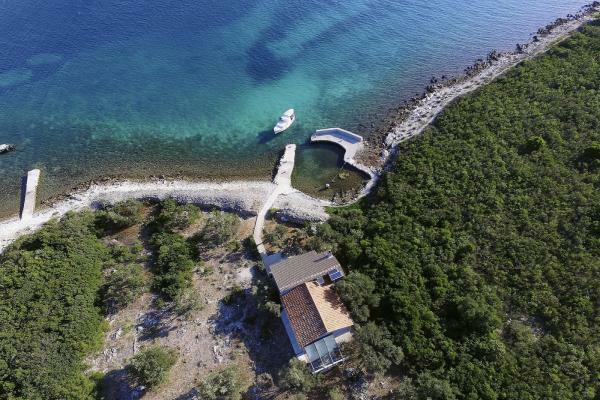 The island of Pasman is on only about 1,5 km distance from the mainland and Biograd na moru. The ferry on this line goes more then ten times a day, and it is travelling about 20 min. The Island of Zizanj itself has no ferry connection to the mainland / other islands, and it is not accessible by car. The house is detached from towns and villages. There are no settlements with shops, bars and restaurants on this island, there are no actual roads, nor ferry ports, just holiday houses visited by people seeking ultimate relaxation through returning to the simple pleasures of life. The island is only accessed by private ships. There is only one fisherman restaurant on the island. The house contains two separate bedrooms, each with a queen bed, and a sofa in the kitchen so it can accommodate maximum 5 persons. The kitchen is equipped with cutlery and crokery, refrigerator with freezer compartment and cooking stove on gas, and a TV set with local programs. This house may offer you also sunbeds and a barbecue. This is a pet-friendly house - pets are welcome on request and against surcharge of 5,00 EUR per day per pet. You leave your car on a free of charge and secure parking in Tkon (island of Pasman). Transfer from this parking place to the house once upon arrival and back to the car once at the end of your stay is also free of charge. The ferry tickets for the ferry that drives between mainlands and the island of Pasman, are not included. Groceries delivery is organized once a week. The water tank holds 18.000 l. Electricity is generated by solar power - 12 V for lighting and 220 V for battery rechargers. Running cold water is installed in the kitchen and the bathroom. The toillet uses sea water for flushing. The bathroom has a shower with thermo-bags, which bags, filled with water, should be placed in a sunny position to warm up the water in them. The water and electricity should be spent here sparingly. This water is originally tap water, but as it is staying in the tank in hot weather, we recommend it to be boiled before drinking, or that the users of accommodation would purchase bottled water for drinking. It is possible to rent this house during the winter, but water can only get heated on the stove, and a winter rental includes additional costs for heating materials. The kitchen has a gas refrigerator and a gas stove. Bed linen are prepared for you. Fresh bed linen arrives once a week. Bathroom towels and beach towels are not available, please bring your own. We recommend that you bring your mobile phone, so you can contact us in case of need. You may recharge your mobile phone in the house, with your regular household recharger. Guests can have WiFi internet in the house with a purchase of a prepaid SIM card that costs around EUR 11 for a week of flat rate internet. 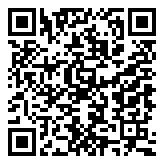 Your device for which you purchase this card will work as a hot spot. Kindly check in during the morning till early afternoon at our agency, because the transfer and the arrival to the reserved accommodation unit is inconvenient at night. After the check-in in our agency you will travel to the island. If you find these details unclear or you have any further questions for which answers can not be found here, please contact us. The Agency can not be held responsible if the customer does not inquire for the details that are important to him but are not mentioned, or for details of the object which are out of any reason not completely clear to the customer. 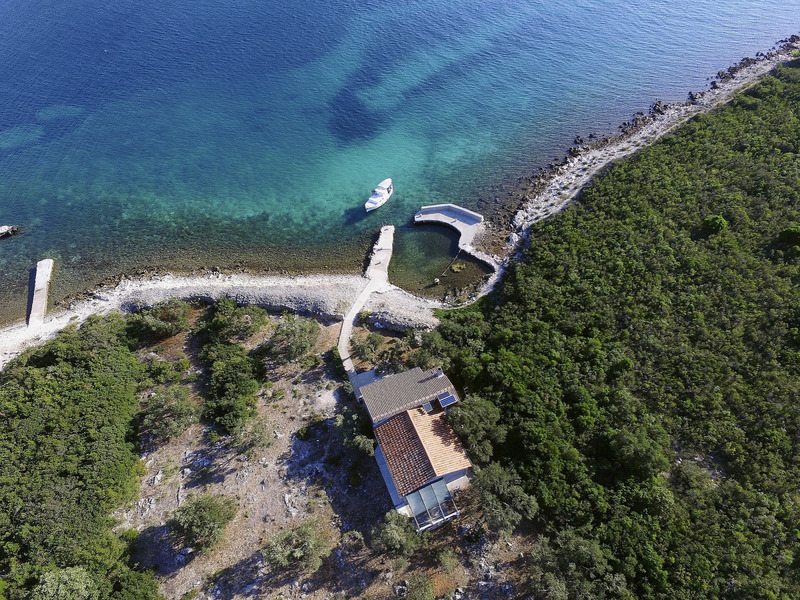 This holiday house is on a small island, Zizanj, which has no ferry connection to the mainland / other islands, and it is not accessible by car! Accessibility by car: Not possible! The house is accessible only by private boats. Private boat transfer from Biograd to the island of Zizanj is included once upon arrival and once upon departure.